Pipeline’s still-uncertain $1 billion-plus price tag will mean a tripling of some water prices , along with higher property taxes and impact fees on development. 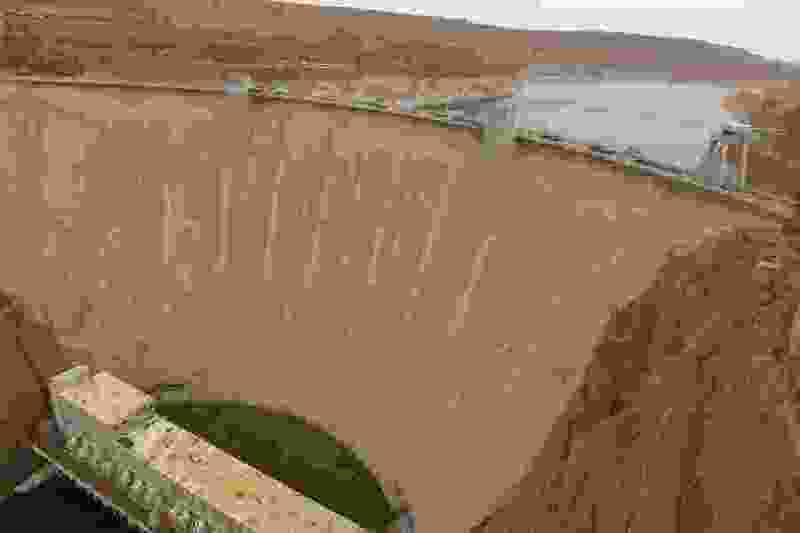 (Leah Hogsten | Tribune file photo) Glen Canyon Dam and Lake Powell. New filings by the state of Utah indicate the proposed Lake Powelll Pipeline's $1 billion-plus in construction costs will mean state borrowing and an increase in water prices in Washington County. Specifics remain fuzzy, but a clearer picture is emerging of just how much Washington County residents might have to pay for water from the proposed Lake Powell Pipeline — and it isn’t going to be cheap. It’s also likely the state will have to borrow money to help pay for a majority of the southern Utah pipeline’s construction costs, judging from new documents filed with the Federal Energy Regulatory Commission (FERC). “Bonded debt is likely going to be pursued,” said Joshua Palmer, a spokesman for the Division of Water Resources. However, he would not say how much of the pipeline’s $1 billion-plus price tag would have to be covered by a state bond. Utah has already begun saving to pay for building the network of pumping stations and 140 miles of pipeline to deliver water from Lake Powell to customers in Washington and Kane counties. But the 1/16-of-a-cent sales tax set aside for the pipeline isn’t likely to raise enough by the time the project breaks ground, state officials have told federal regulators. The documents, filed late Thursday with FERC, also indicate that Washington County residents may soon see sizable water rate hikes and could eventually face higher property taxes and impact fees on new development, as officials consider ways to finance the massive project. While the state Division of Water Resources has yet to release an official estimate of the pipeline’s probable construction costs, the latest projections put the price at between $1.1 billion and $1.8 billion. Utah’s dedicated sales tax is expected to raise $34 million yearly for the project by 2021, when the tax is fully phased in, state officials have told FERC. That disparity suggests Utah will likely have to borrow for the majority of the pipeline’s construction costs. Utah is seeking an operating license for the pipeline from FERC, partly because the project would include a series of hydropower generation stations along its propose route from Lake Powell, through southern Utah and northern Arizona to Sand Hollow Reservoir, east of St. George. Thursday’s filings by the Division of Water Resources came after FERC asked the state for an analysis of the project’s financial feasibility, including details on how its construction would affect water rates paid by customers in Washington County. State law dictates that the the Division of Water Resources would build and pay for the pipeline, but on the condition that Washington and Kane county water conservancy districts contract to repay the state through guaranteed purchases of water from the pipeline. Much of Thursday’s filing focuses on the state’s ability to finance the initial construction of the pipeline, emphasizing Utah’s stellar bond rating. But it also discusses the ability of Washington County Water Conservancy District to raise money — through hikes in water rates, impact fees and property taxes — to pay back state coffers. According to the report, the water district could raise an additional $1.57 billion in revenue by 2065 by boosting water rates by $1 per 1,000 gallons. District managers also plan to raise money by increasing impact fees, levied on new residential and commercial construction, by $1,000 each year through 2026. Washington County Water Conservancy District also has a possible property tax increase on the table, state officials told FERC. Karry Rathje, a spokeswoman for the district, said Friday it has already begun to raise impact fees and water rates to pay for new water projects, including the Lake Powell Pipeline. The district’s board approved the first $1,000 impact-fee hike in September 2017, she said. Water rates, meanwhile, have increased by 10 cents in both July 2016 and July 2017. Those rates will continue to inch up in 10-cent intervals each year until the rate hits $3 per 1,000 gallons, Rathje said. The district currently charges $1.04 per 1,000 gallons. Rathje stressed that those prices reflected the district’s wholesale water rates, the amount Washington County municipalities pay the district for water. Actual residents, she said, pay higher rates. Lozada, who with U. colleagues has analyzed the pipeline’s possible impact on Washington County, said the new information filed with FERC is a sign that water managers are beginning to acknowledge that their past financial models for the project were unrealistic. Officials with the conservancy district, he noted, had disputed the findings of a late 2015 study that said paying for the pipeline would require steep water rate hikes. Washington County Water Conservancy District eventually released a series of PowerPoint slides suggesting the pipeline could be paid for with a residential water rate hike of just $25 per year. Those slides, officials later said, were used for public talks and did not represent the district’s actual plan to pay for the pipeline. Lozada said that effectively tripling Washington County water rates would prompt residents to conserve more and curtail their water use, reducing the cash the rate hike is projected to raise. Similarly, boosting impact fees on development, he said, could put a damper on growth in Washington County, limiting how much money those fees might yield. Those price hikes come at a time when water in Washington County is relatively inexpensive, Lozada said, which may be leading residents to use more water than they need otherwise. And if both water use and population growth decline in Washington County, Lozada said, those trends may even negate the district’s need to construct the pipeline. Some pipeline critics have accused the Washington County Water Conservancy District of using misleading figures to suggest the area uses much more water than is actually consumed — assertions the water district hotly disputes. State officials carefully analyze all large infrastructure projects, Palmer said, “in order to be responsible stewards of taxpayer money.” As planning and permitting for the project continue to move forward, he said, state leaders will continue to examine financial questions carefully, and will share what they find with the public. Lozada said he shares the concern that Utah officials have thus far failed to provide accurate information about the pipeline’s costs and benefits to the public — and have even minimized the pipeline’s potential economic impact, while ignoring any information that suggests otherwise. Correction: Washington County Water Conservancy District plans to raise money for the proposed Lake Powell Pipeline project in part by increasing impact fees levied on new residential and commercial construction, by $1,000 each year through 2026. A prior version of this story misstated the timeframe for that increase.